Get into the Christmas Spirt and go to Hyde Parks’s Winter Wonderland. This event is free to enter and has heaps of activities, including ice skating, an observation wheel and a huge Christmas market! This is a perfect way to get into the festive spirit and is a must-see. Make sure you go and see it before 6 January 2019! The closest tube stations to Hyde Park are Knightsbridge, Hyde Park Corner, Marble Arch and Lancaster Gate. 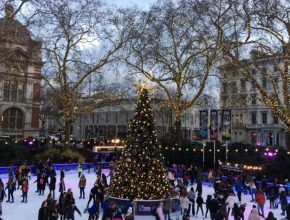 There are plenty of ice-skating opportunities in London all year round, however skating at Somerset House and the Natural History Museum will certainly bring some Christmas joy this December! Their rinks are surrounded by thousands of fairy lights and features glittering Christmas trees, so wrap up warm and get your skates on! These are extremely popular events so book your tickets now at Somerset House and/or Natural History Museum to avoid disappointment. 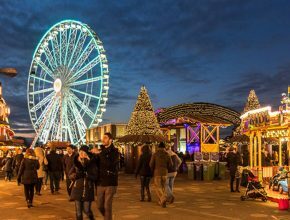 These Christmas Markets have food and drink stalls, festive decorations and handcrafted gifts. Christmas Markets are free to enter and are a fantastic way to get into the festive spirit! Christmas Lights surround the City of London. They shimmer in Oxford Street, Covent Garden, Regent Street and more! 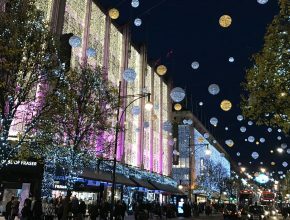 The Oxford Street lights are a must-see display with over 1,100 decorations covering the shopping street. 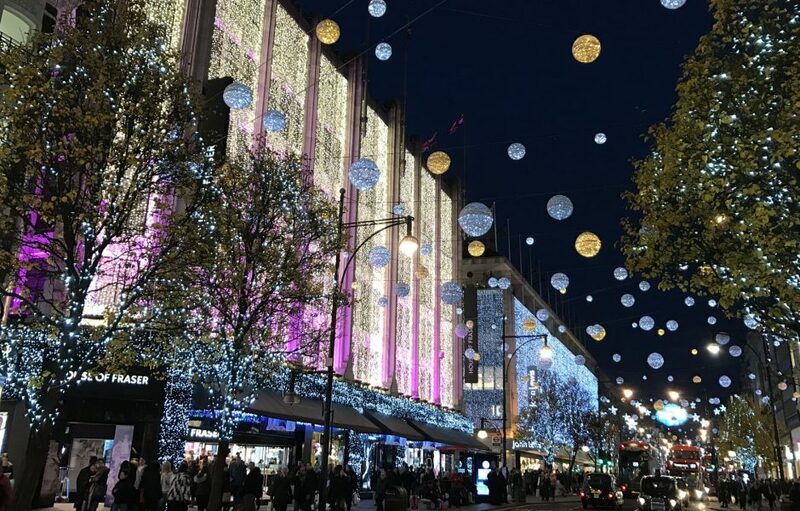 More than 300,000 Christmas lights sparkle above Regent Street making it the largest light installation of London. Covent Garden also transforms into a winter wonderland over the festive period with 100,000 twinkling lights. You can also find light displays at Bond Street, Trafalgar Square, Carnaby and on the South Bank. You can travel to all these places by train from Stratford International or Stratford Underground. Find out the best route to get to these Christmas spots here.